Cloud –based software helps companies manage critical document workflow and exceed regulatory compliance requirements. We worked closely with our valued customers to enhance Document Control. The new features further simplify EHS and Quality customers’ management of mission critical documents. Intelex Technologies, a leading global provider of Environmental, Health & Safety and Quality management software, announces the latest version of Document Control. With this release comes great new features including a more intuitive user interface, streamlined document life cycle management capabilities, smart search complete with document and meta-tag search suggestions, and overall improved integration with other Intelex solutions. Document management is essential to organizations operating in regulatory environments. Businesses that effectively manage key processes like revision tracking thrive by turning compliance reporting into a competitive edge. With Document Control from Intelex, companies can quickly access, and more easily manage and maintain key information using a secure and centralized software solution. Complete version control ensures only the most recent and approved documents are being accessed and used across the organization. Enhanced User Interface streamlines productivity with reduced clutter, fewer clicks, and new drag & drop capabilities. The user-friendly design will empower employees and accelerate adoption to quickly drive value. Life Cycle Management takes the administrative burden away from document owners. Pre-configure how a document is approved, distributed, viewed, and reviewed, eliminating repetitive tasks and drastically improving efficiency. Intelligent Search makes locating key documents easier by searching both the contents of files as well as the metadata based on text search queries. 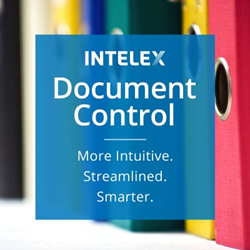 Intelex Document Control is available now. Learn more.